Busy B Family: Video's and a Suprise! Here's a few video's of our Christmas fun this year! This one is Landry helping to make cookies, notice that he eats more dough than anything! This is on Christmas morning at my parents. The boys were all playing with some of their Santa gifts. The motorcycle that dad and Kaleb are riding was Santa's gift to Kaleb. They all seemed to have a lot of fun on it!! Dangerous fun if I must say! That's right, we're expecting Baby #2! Here's a few pictures of my sono earlier this week. After miscarrying our first pregnancy, which we had announced to everyone about the same time, we waited to tell everyone with Landry until we were much further along. 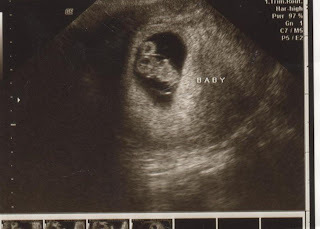 So choosing to go ahead and announce this one was a big and scary decision; but, seeing as how this is our last baby (as long as we don't get another suprise miracle, we figured announcing it for Christmas would be fun. Believe me, this is not something that we had been planning for, but you know the saying, "God only gives you what you can handle." I'm hoping that's true! After the initial (HUGE) shock, we are excited! We just figured when the time came for us to be ready for another one, it would take awhile again, boy were we wrong! So far, everything is going really well and we're hoping it continues that way. 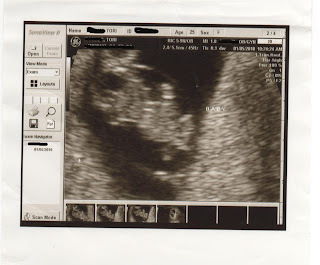 Being a repeat C-section, the baby will probably be here early in August. Please keep us in your prayers for a healthy pregnancy and baby. And please keep us in your prayers that we can teach Landry not to bite before he/she gets here! Landry loved watching the cookie "making" eating video of himself. We are lucky Kaleb didn't drive through the wall when he took off for the first time. That is priceless on seeing Terry run after him. Landry, also, enjoyed seeing the Surprise of Trissa's reaction. We are all so excited for this new journey with you, Chris and Landry. If Landry bites it just love bites, lol. Conrats Tori! I think 2 is easier than one! Briggs' birthday is Aug 3. Hope you are feeling well. Praying for a healthy pregnancy! So happy for you both! Congratulations Tori!! Congratulations! I do have to admit...the picture and video were worth the wait! Super funny and cute. It was a big surprise that thrilled me when I got over the idea of Landry having a real live toy to play with this summer. They will double the joy and excitement around your home. God gives us many blessings. You are in my prayers as well as all my beautiful family. Thanks for the photos you gave to show my friends.I love you . Congratulations! Children are the most amazing thing in the whole world!